By : Mark Lamplugh Jr. This is the time of year we all come together to celebrate something. Whether it’s Christmas, Hanukah or whatever tradition you follow during the holiday season. Spending time with our family and friends is something that we do. Riding around on the fire truck, giving the kids candy canes, and having secret Santas and Christmas parties. December especially is a time of joy in most of our eyes. Firefighters also know that usually around this time we will see or have seen fatalities that affect us. 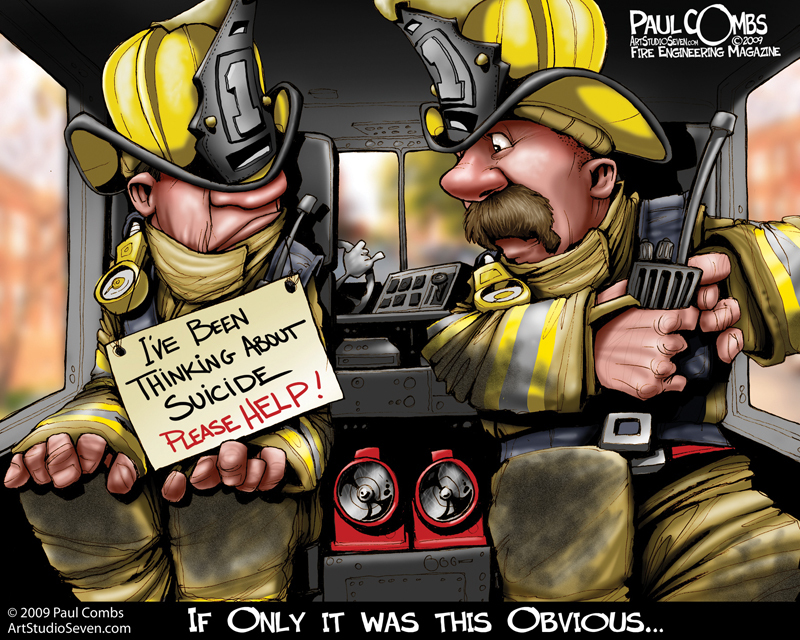 Every year around the December/January holiday I reflect on one particular call from my firefighter experience and it has served as a reminder of how fragile life can be. December 27, 2007 is the day I will never forget. At 3:00 a.m. we were dispatched to a house fire. I was on the nozzle on the first truck due to arrive. When we gained access to the house, I preceded into the front door. I saw them just ten feet from the entranceway, a mother and her two-year-old child lying lifeless on the floor. So close to the door, they had almost made it to fresh air. Out on the front lawn, we went to work on the two, performing hopeful CPR. Unfortunately, they never made it. I know for myself I always remember that mother and daughter at Christmas time. And though we mostly focus on the joys of the Christmas holidays, Christmas can also bring on a lot of depression. It’s an important time of year to really be on the lookout for signs of depression or suicide in our fellow brothers and sisters. The holidays can bring on so many past incidents. Maybe you know of firefighters who have undergone a recent divorce and as a result won’t be spending the time with their kids that they wish they could. Maybe this is the first Christmas they won’t spend with their parents, who recently passed away. Depression and suicide are interconnected. While most people with depression suffer quietly, as many as 15% will eventually commit suicide, and roughly 90% of suicides suffer from clinical depression. These numbers call for us to do what we can to prevent suicide. There are many options available for someone who may be struggling through the holiday. If you are unsure of this person’s status, consult with another brother/sister you trust. If you think someone may need help please feel free to email me. It’s admirable to take a little personal responsibility for each other like we do at the fire scene. The holiday season for many is a time of joy, but for some it can be a time of misery. Let’s give the greatest gift we can give someone who might be hurting. Let’s give the change of getting well. Here are some resources and organizations for you to check out.